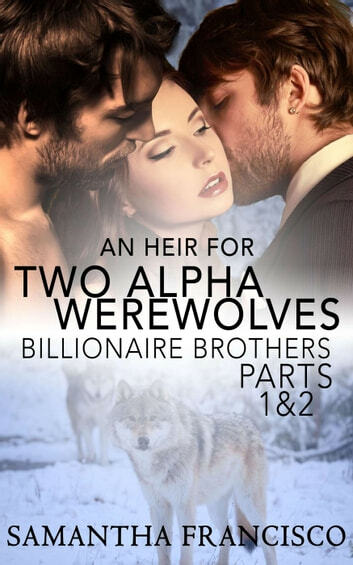 Henry and Rex von Kamp are both billionaires with a genetic ability to shift into werewolves under the full moon. They need a strong healthy mate to give them an heir. Will plump inexperienced Melissa be able to give each of them the heir they both desperately want? When they reached the bedroom, Henry deposited her on the bed and passionately devoured her mouth. She pulled back from the kiss and panted heavily. Her nerves suddenly got the best of her now that it was finally time to consummate their marriage. She looked up at both Henry and Rex as they stood beside the bed, towering over her with raw naked lust on their faces. She gulped as the reality sank in. She was going to be taken by both of these men tonight. Completely owned and used. Her core clenched in anticipation, sending a delightful shiver up her spine even as she trembled in fright. Rex looked down at their new bride. He could tell she was absolutely frightened even in her aroused state. She was untouched and tonight, they would be the ones to teach her the pleasures of the flesh. But did she really understand what it meant to be their mate and the mother of their pups? Can Melissa juggle her first year of college with her promise to give the brothers the heir they both desperately want? Or will she lose everything important in her life by trying to have it all?